In 1996 Donna Karan International went public on the New York Stock Exchange, a crowning achievement for Karan, Weiss, and the designer was hailed once more as CFDA's Designer of the Year and was also honored with the Parsons School of Design Critics Award. The next three years saw the opening of stores in London and Manchester, England; Las Vegas and Beverly Hills; and Short Hills, New Jersey; the introduction of DKNY jeans; the sale of Donna Karan Beauty to Estï¿½e Lauder and Donna Karan Japan to Onward Kashiyama; the launch of men's dress shirts with Van Heusen Corporation; a new infants and toddlers line through Esprit de Corp; DKNY underwear and coat collections; a home furnishings line; and a successful fragrance with Estï¿½e Lauder. Two scents, DKNY Men and DKNY Women, debuted in 1999; the latter with a bottle designed by Weiss, reminiscent of a woman's (presumably Donna's) back. While the Donna Karan name seemed to be everywhere, with licensing deals on everything from jeans, beauty products, footwear, watches, and furniture--sales and earnings seesawed from 1997 through 1999. Happily, after a slew of losses, DKI ended the century with an upswing in sales to $662 million. In 2000 rumors began circulating that French luxury group LVMH Moï¿½t Hennessey Louis Vuitton, which had been gobbling up major players in the fashion industry, was interested in DKI. The official offer came in December, with LVMH offering Karan and Weiss $450 million for Gabrielle Studio, Inc. (named for Karan's daughter Gabby), which held all of the Karan trademarks. Karan and Weiss counteroffered, slashing $50 million off the price if the deal could be done quickly. LVMH agreed and the purchase was completed in early 2001, so Karan and an ailing Weiss, who was dying of lung cancer, could spend their time outside the boardroom. 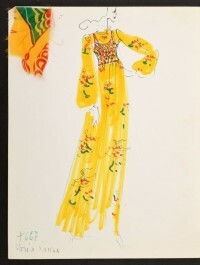 Weiss died in June and while Karan was devastated by the loss, she went on designing for her next New York show, scheduled for September 11. Due to the World Trade Center tragedy, the show was canceled. Karan met privately with buyers the following week, then traveled to Milan to promote her new designs under the aegis of LVMH. 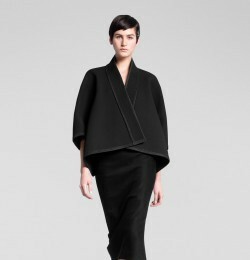 Why are Donna Karan's clothes so popular? She has the answer : "I design what I feel is missing from my closet". Her needs coincide with millions of American working women. her clothes are not fantasies dreamed up in an ivory tower, they are casual chic with emphasis on the female body. The basis of her entire range is the figure suit, nicknamed by her as the "body". Around this revolves her concept of the capsule wardrobe. Karan is still head of the design team for the Donna Karan Collection which she says is a very personal experience for her. With DKNY she oversees a team of young designers led by Jane Chung, who worked with her at Anne Klein. She says "these great young designers continually recharge and inspire me".